The trucks buses and beasts that carried Australia through the past two centuries. The ideal Christmas present for the truckie in your life or any-one with an interest in road transport. 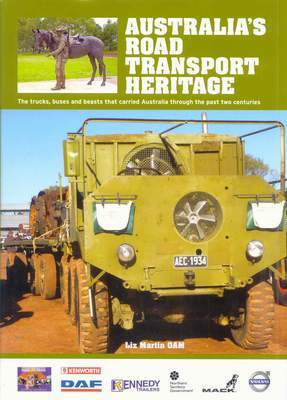 This book was released in August 2015 at the National Road Transport Hall of Fame in Alice Springs. Written by renown transport historian and CEO of the Museum, Ms Liz Martin OAM, this book is the most comprehensive history of Australian road transport yet written. The high quality coffee table book is full colour, features a hard cover and dust jacket with 450 pages of history including over 500 YES, OVER 500 A to Z listings of marques that made their impression in Australia. Do you know what the first commercial vehicle in Australia was? Do you know what a Zeigler, Zeligson or Zeta was? What was a Fowler Landliner or a Bova or Lever's Golden Eagle. ......or a Rugby or Ruggles? How about a Nodwell or the Mole Mink. What connection could there possibly be between Rolls Royce, Aspro and building remote airstrips in Central Australia and soldier rehabilitation? Do you know how to tell the difference between WWII Maple Leaf, GMC, Chevrolet, Holden... Are you sure????? Did the Japs really steal the Austin Seven design to make their famous but short-lived Datsun '13'. Can a car really run on air, or a huge mining truck be remote controlled? What did some Kenworth, Brockway, Mack, Peterbilt, Hayes and Leader trucks have in common???? Why is the T Model called the Tin Lizzie? Why was the People's Car, the VW Beetle called Hitlers Revenge? And which car picks up five times more women than a Lamborghini?